There are interesting and eclectic small and medium size towns dotted across this road trip's path. Towns like Hannibal & Manchester, Ohio; Clarksville and Santa Claus, Indiana; and Metropolis & Cairo, Illinois. And there are some large cities as well to visit such as Cincinnati, Ohio, Louisville, Kentucky, and Evansville, Indiana. Also if you like visiting college campuses, this trip offers takes you to or near MANY different midwestern college and universities to visit: University of Southern Indiana, University of Evansville, Kentucky Wesleyan College, Brescia University Saint Meinrad School of Theology, Indiana University, Mid-America College of Funeral Service, Sullivan University, Bellarmine University, Hanover College, Thomas More College, University of Cincinnati, Hebrew Union College-Jewish Institute of Religion (the oldest Jewish Institute of Religion in America), Temple Baptist College, The Mount (or College of Mount St. Joseph), Cincinnati Christian University, Cincinnati College of Mortuary Science, Xavier University, Shawnee State University, the southern campus of Ohio University, Marshall University, named after former U.S. Chief Justice John Marshall, Ohio Valley University in Vienna, Marietta College, Wheeling Jesuit University, and finally Franciscan University of Steubenville, OH. This trip is loaded with attractions and points of interest many with interesting historical or cultural significance. Some of the highlights in Illinois are: Fort Defiance Park, Mounds City National Cemetery, Olmstead Lock and Dam project, "Superman Square" in Metropolis, IL, Fort Massac State Park, Kinkaid Mounds, city of Golconda which is noted for antique & novelty shops, Cave in Rock State Park, and the famous Garden of the Gods. In Indiana you can visit the Hillforest Mansion, The Howard Steamboat Museum, Falls of the Ohio fossil beds, The Wyandotte Caves, The Hoosier National Forest, The Lincoln Boyhood National Memorial, and The Reitz Home Museum. And in Ohio you can visit the top notch National Underground Railroad Freedom Center, and presidential sites like the Harrison Tomb, the William Howard Taft National Historic Site, and The Ulysses S. Grant's Birthplace, The Wheeling Suspension Bridge, Hannibal Locks and Dam, Hocking Valley Scenic Railway, and Old Fort Steuben. The full description of this Official US Scenic Byway can be found at http://www.byways.org/explore/byways/2286/ . 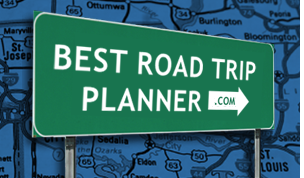 This excellent scenic drive web site also includes pictures, maps, and other good information. Comments: The southern Illinois section along the Shawnee National forest was a sweet surprise scenic area. I had lived in central Illinois my whole life and never new such a beautiful area was so close near by. And not only is it beautiful from a nature standpoint but there is a healthy amount of attractions down there as well. If you are in the area, I highly recommend you head to this southern Illinois/Kentucky border!